Chewing gum is an activity that many of us love for various purposes like killing boredom, feeling the sweetness of the gum, and exercising the jaws. And, did you know that it even helps when one is trying to quit smoking? Yep, it does. Sadly, people are not always good at disposing of gum and chewed gum often ends up in places where it shouldn’t be, like on your carpet, and the situation can be annoying. If you’ve seen sticky gum on your carpet, don’t fret; there are many techniques for removing gum from carpet, and in this post, we will look at some of the most effective ones. Some oils can bleach or discolor fabrics, and so you will want to do a spot test on an inconspicuous area before using the oil to remove the gum. Don’t pour oil on the gum directly, as that will only make the cleaning task afterward difficult. So, get a clean piece of cloth and soak it a little in oil, then use the cloth to saturate the gum glob. As the gum soaks in oil, its stickiness diminishes, and it becomes much easier to remove it. Therefore, get a butter knife and use it to lift the gum off the carpet. Try prying the gum below its lower edges, driving the gum in the same direction and wiping the gum off the knife between passes to prevent gum reapplication. After removing the gum, there might still be some residue on the carpet, and that’s where cleaning comes into play. Use grease-fighting dish soap and water and a clean piece of cloth to clean off the residue. Get some ice cubes, seal them in a plastic bag, and place them on the gum gob. Note: this technique is ideal for fresh gum that was thrown there recently; gum that hasn’t attached itself very deeply in the fibers of the carpet. Before proceeding to the next step, ensure that the gum is well frozen. Using a spatula or a blunt knife, lift the frozen gum off the carpet in scraping motions. As you scrape the gum off, it might break into fragments; lift off as many fragments as possible and when you come across difficult areas, place more ice over them and try removing the fragments. There might be some fragments left after using ice to remove the gum, and you will need to clean this out. So, make a soap-water-vinegar solution (you’ll only need a little vinegar), dip a rag in it, and use the rag to scrub over the area gently. Afterward, use a dry towel to rub over the spot and avoid walking over it until it is totally dry. The best solvents for removing gum include mineral spirits, citrus-based degreasers, and dry-cleaning liquids. You could also use a muscle rub that contains methyl salicylate. The solvent breaks down the bonds within the gum, reducing the stickiness of the gum. Hence, dip a clean piece of cloth in the solvent and use it to apply solvent to the gum. By the by, before applying the solvent to the gum, you want to apply it to an inconspicuous spot first to see how it affects the carpet. Now, before you attempt removing the gum, allow the solvent 10 minutes to work its way through the gum, loosening the bonds. Use a butter knife to scrape off the gum, moving the knife in the same direction, so you don’t damage the carpet. Combine some lukewarm water with some mild detergent then use a sponge to apply the solution to the area. Then, use soapy water to remove any traces that might be left. Are you dealing with hard-to-remove gum? Or, is the gum too small and difficult to remove? A more effective solution would be an ointment like Ben Gay or Tiger Balm. After applying such products to the gum, it will be easy to lift off the gum. Once the gum is gone, use soapy water and towels to clean the spot and then allow it to dry. Do you have products around your house that are meant for removing sticky or greasy dirt and debris? These can work for you too. You can either use an old toothbrush to apply the product to the gum, or use a sponge or soft piece of cloth. After applying a product like goo, the gum will typically start breaking apart, and vacuuming it up will be a good removal tactic. Caution: if you choose to use chemicals like goo to remove the gum, be sure to work swiftly and clean the product from the carpet before the carpet fibers start breaking down. Are there many gum globs on your carpet? Or, are the gum globs hard to remove? Then you will need a more powerful remedy, like a carpet cleaning machine. But before you use it, make certain that your carpet ca safely be cleaned with a cleaning machine. 1. Is it possible to remove gum from carpet using Goo Gone? Yes, but exercise caution when using Goo Gone, as the product is adhesive remover. If you use too much of the product or leave it on there for too long, it will end up removing the adhesive material that holds the carpet fibers to the carpet backing, and the results won’t be very attractive. We recommend you pour some Goo Gone on a separate rag and use the rag to work the gum out. 2. How can I get gum off my car carpet? The same methods you use for your home carpet will work for your car carpet. For instance, you can freeze it or apply oil and then attempt to pry it up using a butter knife or metal spatula. 3. I tried removing gum using the freezing method, but there are still gum fragments on the carpet. What should I do? Try vacuuming the fragments or apply some oil then attempt to scrape them out with a blunt knife. 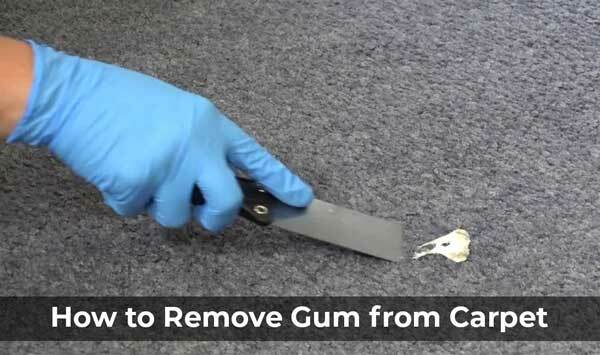 Those are some of the most effective DIY ways of removing gum from carpet. If you’re using a product to clean your carpet, don’t forget to do a spot test first to ensure there are no negative effects. If all the tactics we’ve described here don’t work for you, then you might want to consider contacting a professional carpet cleaner. They will most likely have the equipment needed for the job, and you’re more likely to love the results if a good professional does it for you. Go ahead and share this article with your social media buddies.